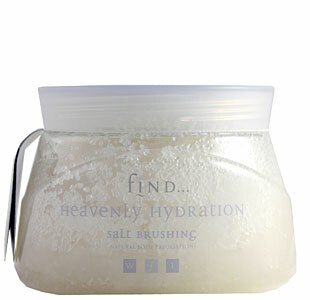 So, I’ve heard it on the grapevine that salt brushing is all the rage right now, so I was more than a little intrigued when Spa Find kindly sent me their lovely Heavenly Hydration Salt Brush Treatment to try! Now I regret having to say that I was so excited to receive this, that I forgot to take pictures before using it, so sorry there aren’t any of my own photos!! Spa Find are one of those ‘at home’ Spa brands that seem to be creeping up on us quite quickly at the moment. The industry seems to be steering away from treatments at the spa, and guiding us into the ‘1/2/3 minute facial’ direction, which is fine of course! I really love Spa Find’s ‘holistic’ approach to the products, everything is inspired by mother earth – just the way it should be. Although I obviously love natural products, I am always a little wary of using natural exfoliants as I have heard so many things about them being too harsh for your skin, and I must admit, I once used a salt face scrub that tore my skin, so I’m a little sceptical! It has got to be said, this product is luxurious – it contains 100% natural salt minerals, mixed with coconut oil and a citrus oil blend to keep your skin wonderfully hydrated. It is rich in Vitamin E, so it also boasts excellent anti-ageing effects, too. The instructions say to apply this to dry skin before your bath or shower – and I’d suggest standing in your bath or shower whilst you do this, as it does tend to go a little bit… everywhere. Although I do see applying the salt to dry skin as necessary, it is a little bit awkward just standing there with no water running scrubbing yourself, but it’s worth it in the end! I tend to apply this mainly to my legs as they tend to get neglected. My skin gets quite dry, tight and itchy so this is a lovely relief. The salt removes all dead skin cells and the oil blends leave my skin moisturised, but not greasy at all. It is suggested to use this as a weekly treatment, but I simply use it when I feel like I need a little pick me up, so it really is up to you. My only negative comment is that the salt is quite abrasive on dry skin, and it can sometimes irritate my hands a little bit when I’m rubbing it it, so if you have a little wash mit, brush or sponge I would recommend using that to protect your hands. Otherwise I really do enjoy using this product, and hope to incorporate some more Spa Find products into my skincare regime – I happen to have my eye on one of their masks. This salt scrub retails at £13.15 for a huge 500g tub, so it’s really affordable and has worked it’s way up to their best seller! It has even been rated as the ‘Best Body Scrub’ by You magazine. There are so many other products in the Spa Find range that take my fancy, they do sand scrubs, mud masks, bath salts.. loads of stuff! Have you ever tried any of thier products, what did you think? Thank you! Hell yeah, makes me realise how much I neglect everything except my face haha! Might try to top up my body product selection – any suggestions? This looks lovely – I’m obsessed with body scrubs, as i have keratosis pilaris (those little red bumps) on my upper arms, so I’m always on the look out for the perfect one!